The following steps are provided to help get you started projecting your Windows Mobile handheld's screen contents with your ShowMate. For complete instructions on how to use your ShowMate, please refer to the ShowMate User's Manual. You may also download a PDF version of these Getting Started instructions for future reference. 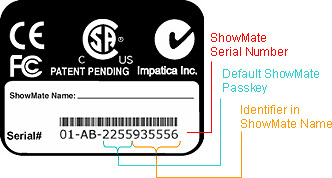 To use the Screen Projector application, the ShowMate must have firmware 2.3.5 or later. To determine whether your ShowMate has the proper firmware version installed, connect your ShowMate to a power source and display. The ShowMate splash screen will appear, displaying the version of the firmware currently installed. If the version number is not 2.3.5 or higher, use the ShowMate updater software as follows. When you are finished projecting, select the Impatica Screen Projector application icon again. You will be presented with a "Confirm" dialog box asking if you would like to stop projecting. Select "OK" to stop projecting or "Cancel" to continue projecting.